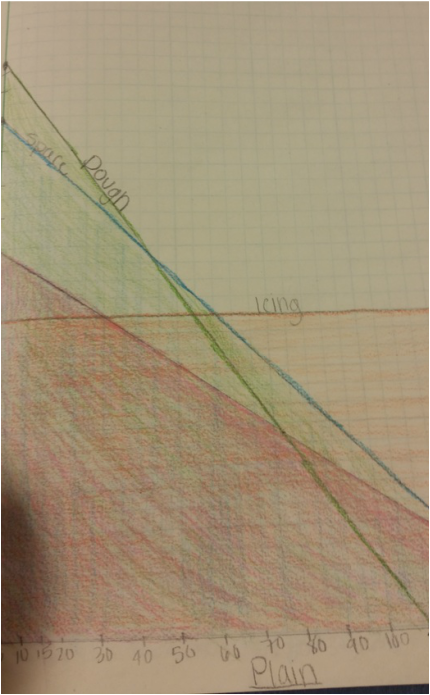 During the first semester of Algebra 1 the content I learned included combining like terms, solving systems of equations, feasible regions, graphing and solving inequalities, measuring angles, similar polygons, similar triangles, identifying adjacent, opposite, and hypotenuse on a triangle, and basic trigonometry (sin, cos, tan). Out of all of the content I have learned this semester, I am most confident in basic trigonometry. Worksheets that helped me learn and improve in this skill included the quiz review, trigonometry worksheets, along with the trigonometry quiz. Below is this quiz and how well I did on the questions applying to trigonometry. To improve my knowledge in the skill of trigonometry, I practiced using tan, cos, and sin in worksheets. I practiced remembering SOH CAH TOA to remember how to solve the trigonometry problems. It was definitely a struggle remembering what these stood for and understanding exactly how trigonometry worked. 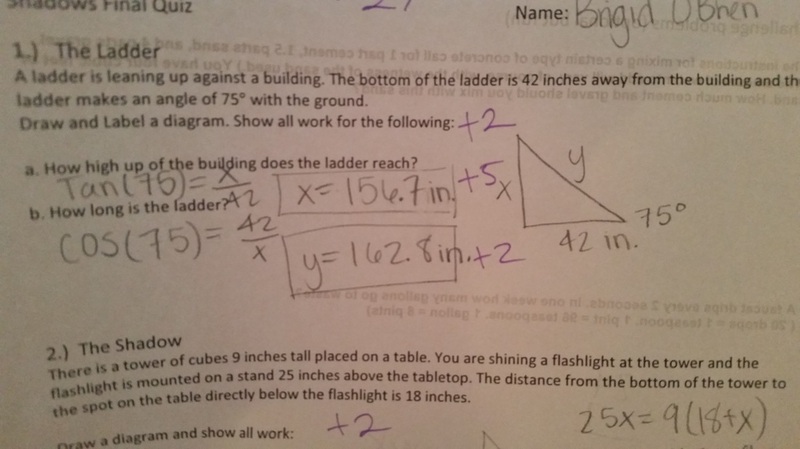 After I practiced it and clarified questions I had with my teacher I was much more confident in using trigonometry. I believe this math quiz shows my acquired skill of trigonometry because this correct problem, how hard I studied for this quiz and worked on it. The skill that I have acquired over this past semester for problem solving is generating ideas. This includes, learning how to formulate a plan, generate multiple means of approaching a problem, brainstorming plans, and identifying and applying appropriate mathematical tools. An example of this acquired skill can be seen in POW 4, below. Doing this POW I struggled with the fact that I had to use multiple trial and error systems to figure out the final formula. It took a lot of work, but helped me develop stronger brainstorming plans. I anticipated major steps and formulated a plan in this POW because I knew I had to find a pattern, make an in and out table, and figure out a formula. I used diagrams to see how I might figure out the formula, and I used the formula to figure out the final problem. A key realization in this problem was that I figured out the numbers of touchdown and field goal multiplied by each other somehow equaled the highest impossible score. This POW was a struggle for me to complete and achieve because of its complexity, but I was intrigued to figure out the formula, so I used series of trial and error to complete it. Below is the Cookie Cover Letter for this project.